GeoGarage blog: ‘Unofficial Charts’ on the horizon? In the article entitled ’How Blockchain Will Have an Impact on Navigation’ published in the March/April 2018 issue of 'Hydro International', Gert Büttgenbach explains how the new blockchain technology could be potentially beneficial for the production and distribution of nautical charts. One of the conclusions of the article indicates that the new technological environment calls for reconsidering the ’exclusive domain of national Hydrographic Offices’ (HOs) and suggests that the private sector could in future produce ‘unofficial charts’ that would be superior to ’official’ charts produced by the HOs. But these views reflect a misunderstanding of the situation, according to Gilles Bessero. I believe that encouraging the community to think about the impact of new technologies is always a good thing, especially in an environment that is often considered, whether rightly or wrongly, as rather conservative. 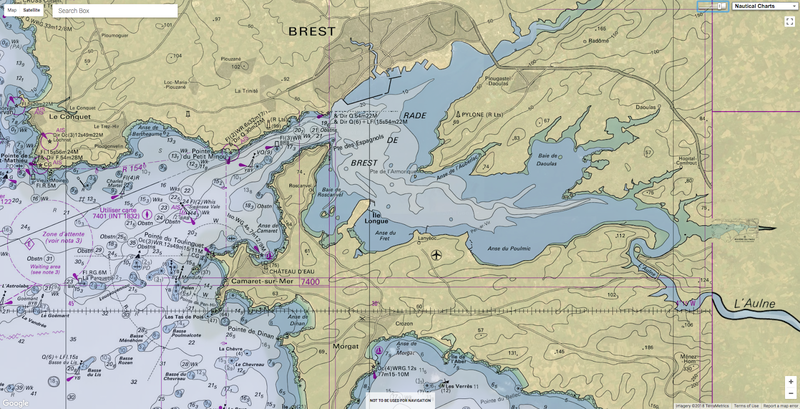 The question as to which organizations should be entrusted with the production of nautical charts as a key enabler of safe navigation is the subject of recurrent debate. As a matter of fact, this was originally an activity run mostly by private chartmakers and chart information was considered a trade secret. Detailed Depot De La Marine's sea chart of the region centered on Jamaica, with the southern part of Cuba and western end of Hispaniola. This detailed map of Jamaica, shown divided into parishes, includes strong topographical details with many coastal toponyms, as well as the coastlines of southern Cuba and western Haiti. The Dépôt de la Marine, known more formally as the Dépôt des cartes et plans de la Marine, was the central charting institution of France. The centralization of hydrography in France began in earnest when Jean-Baptiste Colbert became First Minister of France in 1661. Under his watch, the first Royal School of Hydrography began operating, as did the first survey of France’s coasts (1670-1689). In 1680, Colbert consolidated various collections of charts and memoirs into a single assemblage, forming the core of sources for what would become the Dépôt. The Dépôt itself began as the central deposit of charts for the French Navy. In 1720, the Navy consolidated its collection with those government materials covering the colonies, creating a single large repository of navigation. By 1737, the Dépôt was creating its own original charts and, from 1750, they participated in scientific expeditions to determine the accurate calculation of longitude. In 1773, the Dépôt received a monopoly over the composition, production, and distribution of navigational materials, solidifying their place as the main producer of geographic knowledge in France. Dépôt-approved charts were distributed to official warehouses in port cities and sold by authorized merchants. The charts were of the highest quality, as many of France’s premier mapmakers worked at the Dépôt in the eighteenth century, including Philippe Bauche, Jacques-Nicolas Bellin, Rigobert Bonne, Jean Nicolas Buache, and Charles-François Beautemps-Beaupré. The Dépôt continued to operate until 1886, when it became the Naval Hydrographic Service. In 1971, it changed names again, this time to the Naval and Oceanographic Service (SHOM). Although its name has changed, its purpose is largely the same, to provide high quality cartographic and scientific information to the France’s Navy and merchant marine. France was the first country to establish a national Hydrographic Office in 1720. The rationale behind this initiative was that more warships were being lost at sea because of lack of access to charts than in combat. The benefit of assigning a dedicated public organization to the task of collecting all available information, compiling it and making it available through ’official’ nautical charts was progressively recognized and all maritime nations followed the lead of France more or less rapidly. Some private chartmaking continued into the 20th century but it was generally focused on the specific needs of the leisure market. The obligation for ships to carry adequate and up-to-date nautical charts and publications was introduced in the International Convention for the Safety of Life at Sea (SOLAS) of 1974 (regulation V/20) but the provisions related to the production of adequate nautical charts and publications were left at the discretion of the Contracting Governments. Carte de la rade de Brest en 1779. In the late 1980s, the advent of the digital era created a new opportunity for private entrepreneurs who were keen to develop electronic chart systems (ECS) and proposed digital nautical charts generally obtained simply through digitising the paper charts produced by HOs. When the progress of ECS technology led to the consideration of using such systems not only as navigation aids complementing paper charts but as meeting as such the SOLAS chart carriage requirement, the International Maritime Organization adopted Performance Standards for Electronic Chart Display and Information Systems (ECDIS) in 1995. Considering the liability aspects, the Performance Standards included a provision that the associated Electronic Navigational Charts (ENCs) had to be issued ’on the authority of government-authorized hydrographic offices’. This provision was refined in the amendments to the SOLAS Convention that were adopted in 2000 and entered into force on 1 July 2002. These amendments include a definition of a nautical chart or publication as ’a special-purpose map or book, or a specially compiled database from which such a map or book is derived, that is issued officially by or on the authority of a Government, authorized hydrographic office or other relevant government institution and is designed to meet the requirements of marine navigation.’ (regulation V/2.2). They include also the requirement that ’Contracting Governments undertake to arrange for the collection and compilation of hydrographic data and the publication, dissemination and keeping up to date of all nautical information necessary for safe navigation.’ (regulation V/9). Now it is up to each Contracting Government to decide which arrangements best suit its circumstances. The requirement is solely that nautical charts and publications should be produced on the authority of a Government and this is justified by the liability issue, noting the extent and cost of the damages that could be caused by a ship’s grounding due to a charting error. As explained in Publication M-2 of the International Hydrographic Organization on ’The need for hydrographic services’, ’Coastal States can satisfy their hydrographic needs and obligations through a variety of arrangements (…). The reality is that a number of HOs do outsource production activities to the private sector. Therefore, one should not oppose HOs versus the private sector and ’official’ versus ’unofficial’ charts but encourage both sides to imagine together the most efficient ways to improve future ’official’ charts for which governments continue to accept full responsibility. In that perspective, it is worth noting that HOs are evolving from a traditional chart-centric model to a data-centric model in order to address the variety of hydrographic requirements associated with all human activities that take place in, on or under the sea and support the sustainable development of the oceans. This means that delivering a portfolio of nautical charts covering the waters of a country is no longer an end in itself but one of the many applications of a national marine spatial data infrastructure that must be considered as a public good. The private sector can and should play a major role in developing tools to manage efficiently the MSDI as well as in inventing and developing a variety of value-added products and services derived from that infrastructure. But as long as shipping remains a significant component of the world trade infrastructure, there will continue to be a substantiated need for ’official’ nautical charts.